V20 - 899 Valencia is a bright new presence in San Francisco’s sunny Mission district. An area noted for its colorful murals and graceful Victorians. Responding to the neighborhood’s existing housing, V20 employs a series of setbacks and deep upper-floor recesses to create a multi-layered façade that adds visual depth. 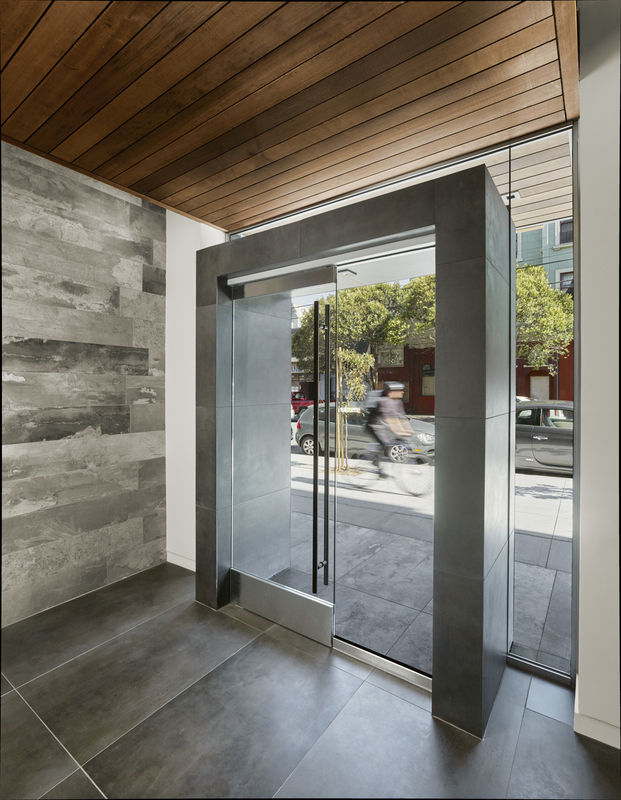 The orange and charcoal exterior is a nod to the Mission’s playful palette; glass-and metal-paneled facades lend texture and pattern to the composition. The custom-designed flats and townhouses with individualized, layouts give each residence a unique feel. Private and common roof decks and a generous courtyard supply abundant outdoor living space while large windows afford views of Downtown, Bernal Heights, and Twin Peaks. The interior scheme features dark accented cabinets offset by pale wood floors. Resident parking is below grade, while at ground level, generous storefront glazing and varied commercial tenants enliven the street. A vital, new mixed-use building in San Francisco’s SoMa neighborhood. 988 Harrison will be a new mixed-use building vital to San Francisco’s SoMa neighborhood. At eight stories, the building will house studios and one- and two-bedroom units, all with balconies. Two walk-up units with separate entrances face onto Clara Alley, activating the street. Kerman Morris Architects is the Architect of Record for the project, which was conceptually designed by Workshop1. Amenities include a shared rooftop deck and interior courtyard, and 3,000 square feet of ground floor commercial space. A portion of the units within the building will be designated as affordable housing. 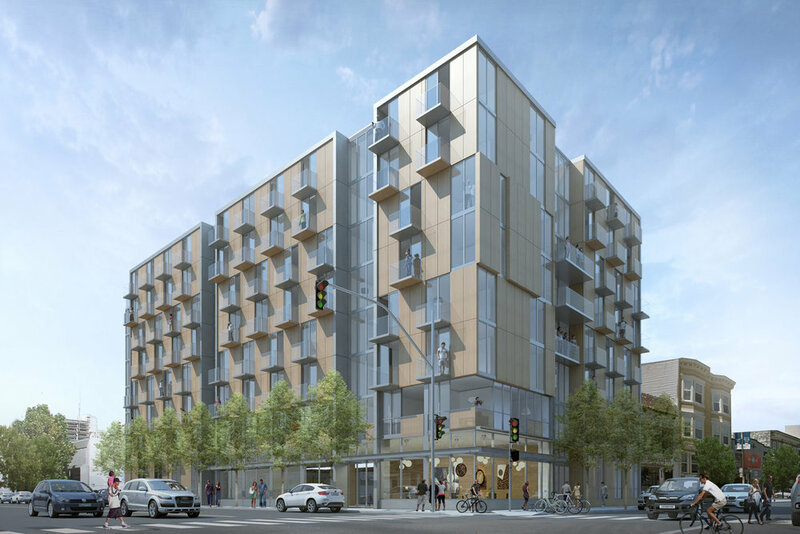 Situated close to Mission Bay and Mid-Market, 988 Harrison will be an anchor in the neighborhood’s redevelopment, providing much-needed housing and retail in this under-utilized area. Building anew while preserving history. 807 Franklin is currently the site of an historic grand Victorian home with a large side yard. KMA has secured planning approval to move this structure to a new location in the neighborhood (at 635 Fulton Street next to a Victorian-era mortuary) and rehabilitate/restore both of them into housing. 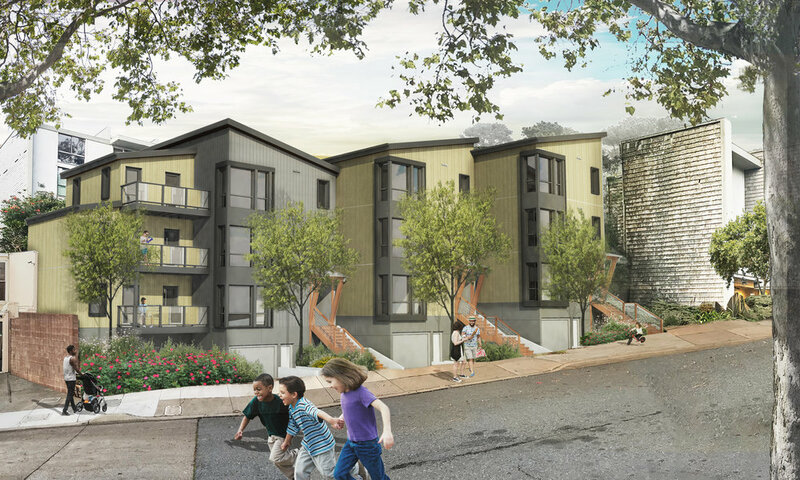 The cleared project site will be developed into 48 new units of rental housing in an eight-story concrete structure with outlooks over Hayes Valley and Jefferson Park. Sixty-four percent of the units will be two and three bedrooms, suitable for family living. A simple structural grid and full-height fenestration with private balconies supports a minimalist Bauhaus aesthetic and high degree of transparency. The rooftop and rear yard will support outdoor living for the residents: seating and gathering, an outdoor kitchen and farm table, raised planters, planted dog run, and artificial turf. The project will seek LEED Gold certification with photovoltaic power generation and solar preheating on the roof, healthy interior finishes, and efficient mechanical systems. A portion of the units will be affordable housing. The eight new Habitat for Humanity townhouses will be 100% affordable and available to low income families who invest significant sweat equity constructing their own homes under the Habitat model. KMA is donating a significant proportion of our services, providing design and construction documents, facilitating permitting, and partnering with other like-minded consultants. In partnership with Habitat construction management staff, the design aims for functionality, simplicity of construction, durability of systems and materials, and low maintenance. Flexible and efficient living in the heart of the Mission. 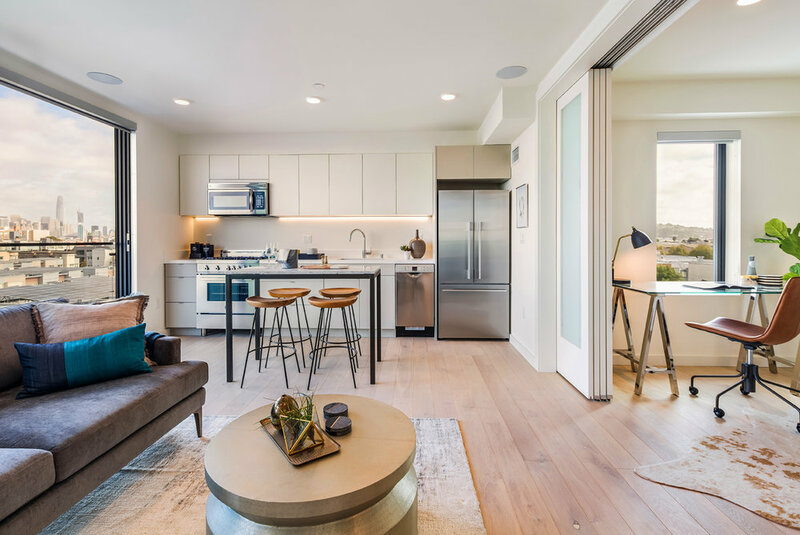 This new nine-unit development in San Francisco’s Mission District is designed with efficient layouts, open floor plans, and amenities to create flexible space for accommodating single or multiple inhabitants. The building comprises one- and two-bedroom rental apartments, some including a second room with sliding doors, which can be used as a den or second bedroom. Elevated decks or ground floor walk-outs provide private outdoor space for several of the units. A shared yard at the back of the building is accessible to the rest of the units. 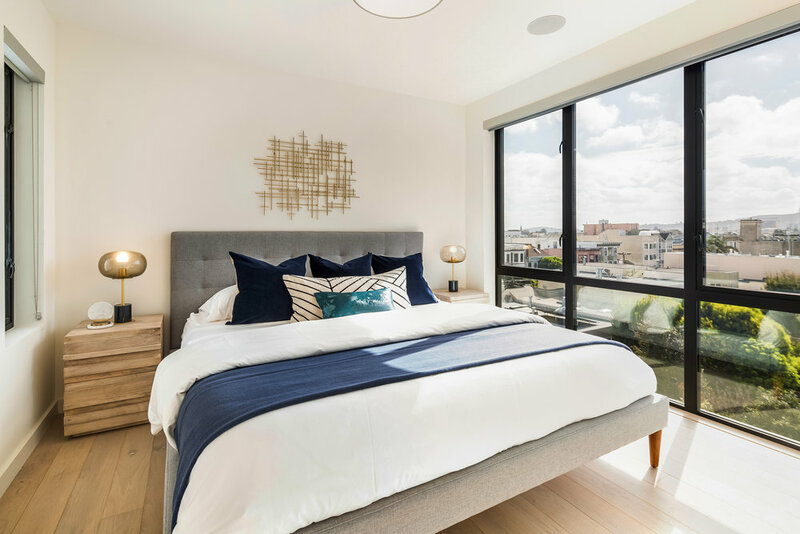 The building is GreenPoint Rated and features energy-efficient components including hydronic wall heaters, large windows and skylights providing ample daylight, dual paned windows and patio doors, water efficient fixtures, Energy Star appliances, and zero- or low-VOC finishes. A large underutilized lot in San Francisco’s Diamond Heights neighborhood afforded space for two ample, three-level homes. Contrary to typical San Francisco development patterns with units facing the street, an alternative approach was taken; siting the new homes along a common driveway and providing more visual space around the original Victorian farmhouse. Responding to the surrounding context of 1960s and 1970s development, the boxlike masses are assembled in layers with varying setbacks in a play of volumes. Large picture windows and double height entryways further distinguish the façade while inviting light indoors. The kitchen, living room, dining room, powder room and decks are situated at the top level to make the most of East Bay, Downtown, and South Bay views. Convenience elevators help navigate the vertical spaces. The 468 Clementina project is a new housing complex in San Francisco’s South of Market neighborhood. The property contains 13 deluxe units including studios, one and two bedroom condos, and two townhouses with private fenced yards. 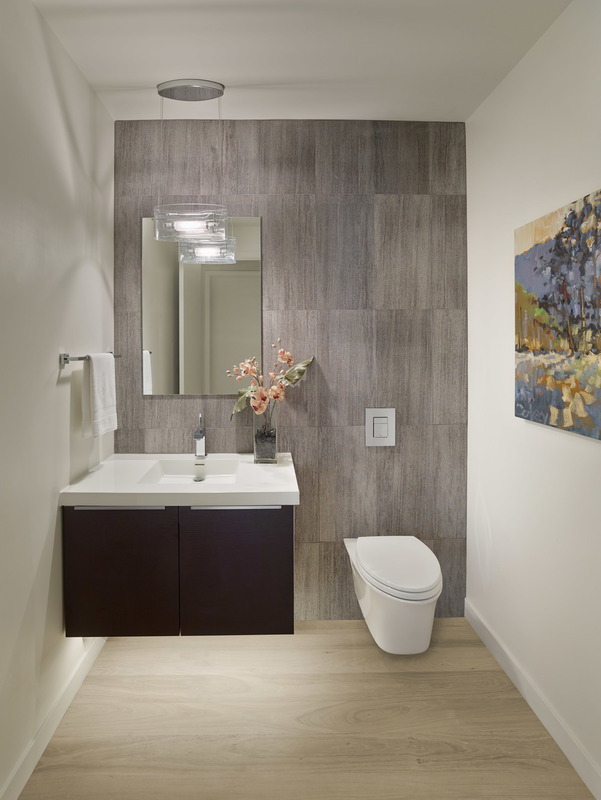 The units feature wood and tile floors and high-end fixtures. Large operable windows and glass doors connect indoor and outdoor spaces and provide daylighting and air flow. The building boasts a rooftop terrace with city views. 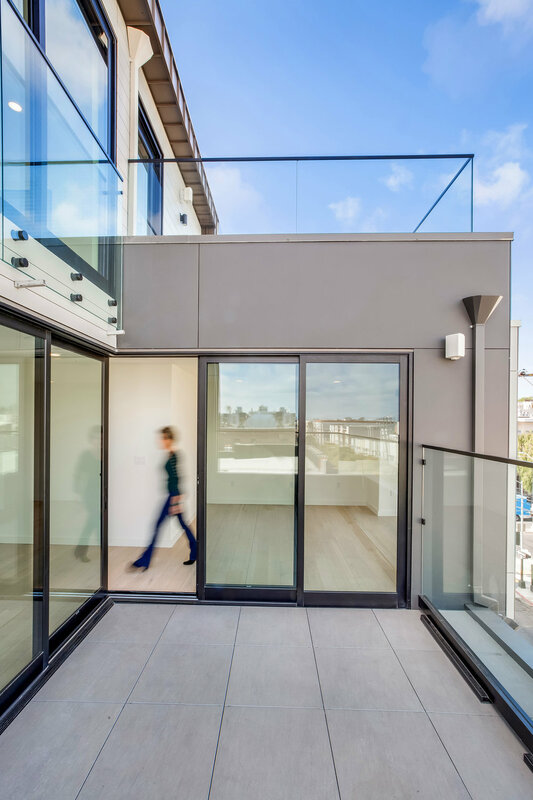 Abundant indoor-outdoor spaces distinguish this four-story condominium development in San Francisco’s Mission neighborhood. 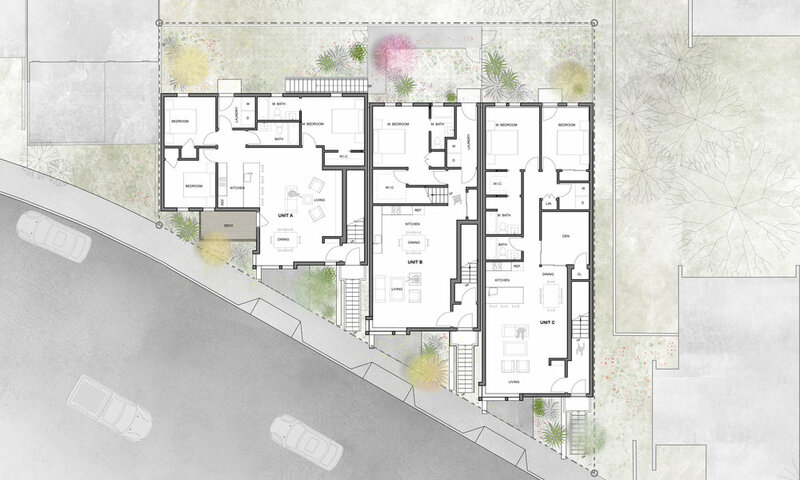 The 12 two-story units include two with garden access and one with a private walk-up from the sidewalk. Each apartment’s design establishes a strong connection with the outdoors via large windows and balconies to take advantage of the neighborhood’s warm, sunny weather. Wood lattices constructed of sustainably harvested ironwood form the balcony rails and ground-level window screens. Wood and stone cladding compliment the prefinished metal bays with floor to ceiling glass to create a warm and modern presence. This small infill project serves as a model of green development. The plan for the historic Victorian in San Francisco’s Russian Hill maintained the original façade, gutted the interior space, and increased square footage by expanding upwards and to the back. Two interwoven units were carved out of the L-shaped lot and a Zen roof garden sits atop the building. Recycled materials such as reclaimed wood and recycled denim insulation, as well as high-efficiency mechanical systems conserve water, gas and electricity. The lower two-level unit opens to a private landscaped rear yard; the upper residence takes in majestic views of the Golden Gate Bridge. Large picture windows further orient the units outward. 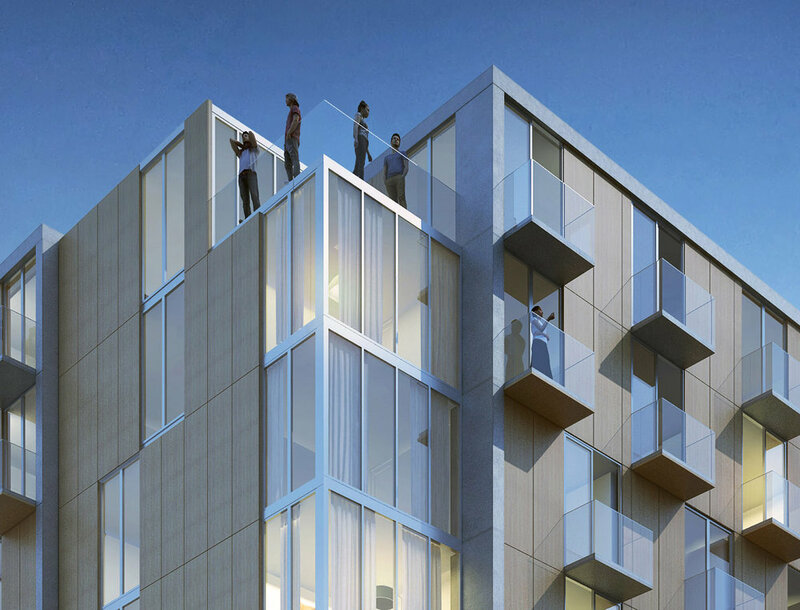 This project in San Francisco’s low-rise Richmond district comprises four two-level townhomes. Each townhome has outlooks to green space and a beloved city landmark. Floor to ceiling windows let daylight in while carving out views of Golden Gate Park and the Golden Gate Bridge. Each unit has a landscaped yard, roof deck, or back patio to enhance indoor-outdoor living. The three-bedroom units, ranging from 1,400-1,800 square feet, feature clean lines and dramatic dark wood floors. 345 6th Street is a mixed-use building housing two Production Distribution and Repair (PDR) spaces at the sidewalk level, and 36 one- and two-bedroom units above. Facilitating the transition of this South of Market SoMa neighborhood from its light industry past to today’s mix of housing and local employment opportunities, the building features large plate glass storefronts, giving access to the PDR spaces and activating the pedestrian experience with high levels of transparency to the activities within. Above the first floor, the efficient units feature small indoor/outdoor decks that can be shuttered off, providing more living space and privacy for building residents. Common open space is located on the roof and at the south facing courtyard on the second floor, along with flow-through planters for greenery and mitigation of runoff during storm events. 2600 Harrison Street is a mixed-use structure that will house 1,200 square feet of Production Distribution and Repair (PDR) space at the sidewalk level and 19 mostly two-bedroom units. Currently the site of defunct warehouse, the new building will be broken down into three masses with simple fenestration of sliding glass doors, painted metal railings and traditional horizontal v-groove painted siding. A blend of old and new, the structure looks to the proportions and fenestration of the older light industrial buildings in the district while embracing the clean detailing of a contemporary building of its time. Streetscape improvements will enliven the pedestrian experience and invite passersby to linger or engage with the activities of the PDR including columnar street trees, special paving leading to the entrances of the PDR and Residential Lobby, and outdoor seating. Raised planters in front of street level windows provide a degree of privacy to the inhabitants. Both private and common open space are provided at the roof level, as well as ample area for photovoltaics and planters. The project will be Green Point Rated with energy efficient, water saving systems and environmentally preferable, healthy interior finishes. Lushly landscaped courtyards create an urban retreat for residences of this five-story Mission District development. 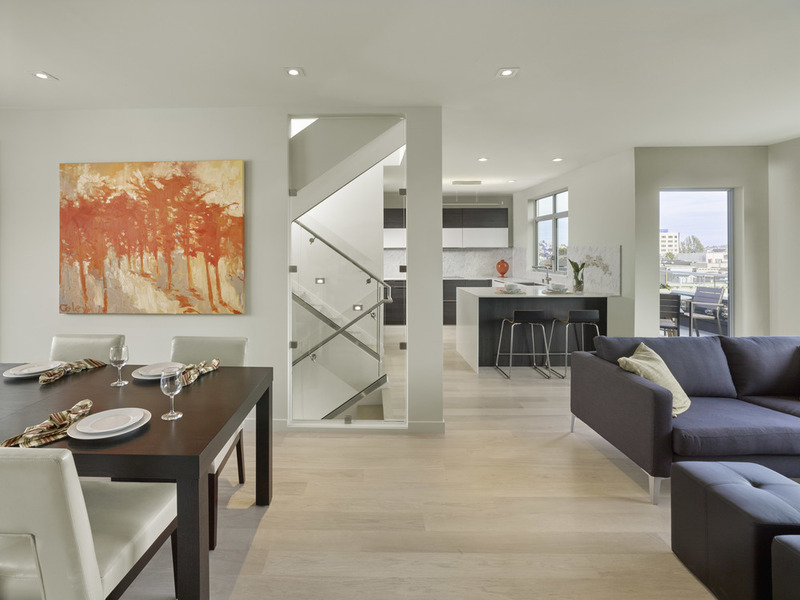 The 32 one-and two-bedroom units feature open plan layouts and well-crafted finishes. The residences face either the street or tranquil interior courtyards. A network of open air bridges and corridors connect units at each floor. To activate the streetscape, the commercial storefront takes visual precedent over parking and egress doors. A stone base, painted siding, and traditional trim further enhance the architectural expression of the lower two stories of this infill development. 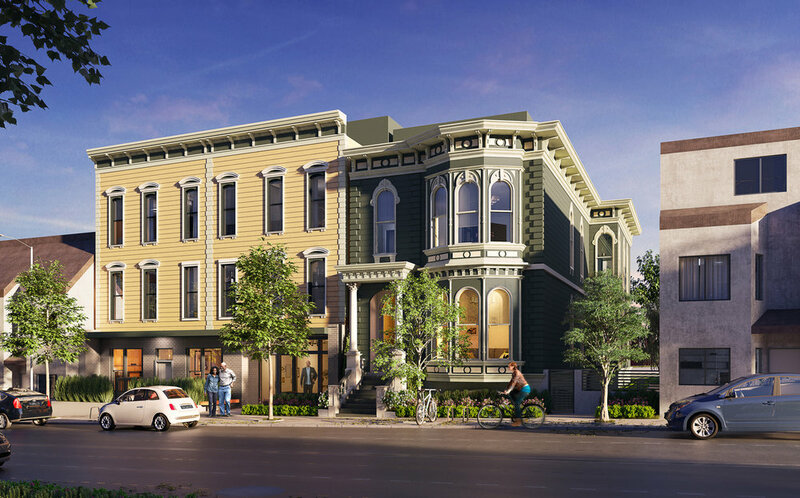 This project restored a faded beauty in San Francisco’s up and coming Mid-Market Street district – providing much needed housing and serving as an early catalyst for further development in the neighborhood. The historic Wilson Building – designed by Willis Polk and constructed in 1901 – was converted into 67 studio and one-bedroom units, as well as a handful of larger top-floor/bi-level units. The design restored the building’s terracotta façade, incorporated traditional wood sash windows, and preserved interior elements such as the original sky-lit open stair. It also integrates a new light court which channels natural light to the interior units. The ground floor provides commercial space at sidewalk level and the basement, storage and fitness center amenities for the residents. A large roof deck provides views and open-air living for the residents.